Toyohara Kunichika (1835-1900) The Actor Onoe Kikugoro V (Onoe Baiko), from the series One Hundred Roles of Baiko, 1893. Oban. We know everything about this print except the subject matter and the play that it depicts. Nevertheless it remains a very fine piece indeed. 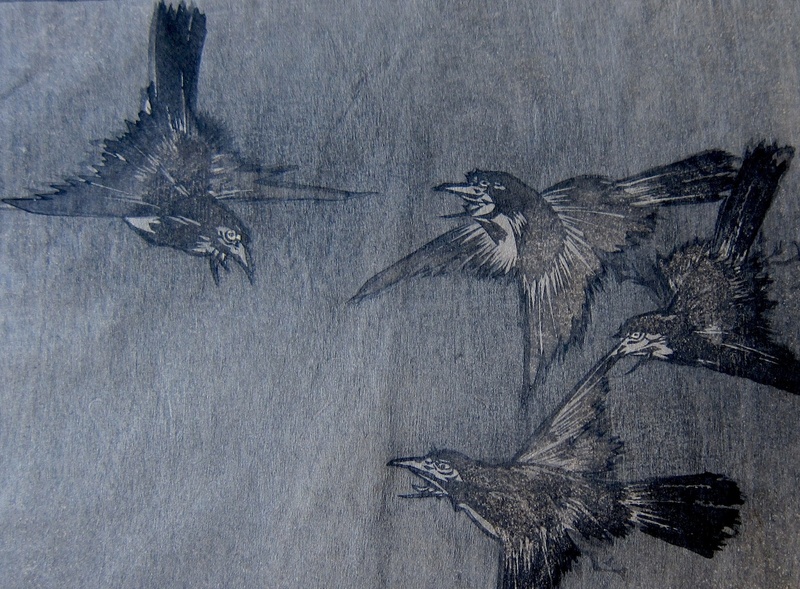 We have included it because of the quite unique, naturalistic depiction of the birds in the upper left of the print. 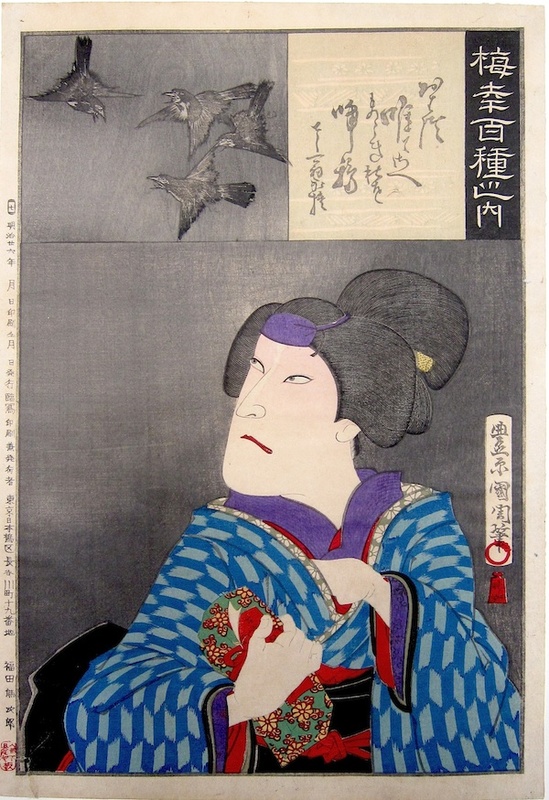 Unique in as much as Kunichika rarely used this level of naturalism in his work. The drawing of the birds is delicate and sensitive and closely observed, the subsequent printing in subtle shades of grey against the deliberately raised grain of the wood behind is masterful. I would go so far as to say that the inset panel of birds is the finest piece of observational drawing in Kunichika’s output. Kunichika was an artist who used so many levels of abstraction and torsion in his drawing that naturalism - observational drawing - played very little part in his practice. His great achievements are in the field of design and composition. The print is from Kunichika’s series The 100 Roles of Baiko. Baiko was the stage name for the popular kabuki actor Onoe Kikugoro V. Kunichika and Kikugoro were friends and this ambitious series, printed on fine paper and using extensive blind embossing and mica powder was commissioned by Fukuda Kumajiro in 1893. The bulk of each print portrays the actor Onoe Kikugoro V; the upper register shows a different actor in the supporting role, unusually this print omits the supporting role (one of two designs out of the one hundred prints) which suggests that it may depict one of the dances that Kikugoro was fond of performing. The print is full size, in very fine condition. The colour and impression are very good with embossing to the cartouche and burnishing to the black obi of the figure. A minor crease to the left side. Publishing information retained on left margin. Signed Toyohara Kunichika hitsu, published by Fukada Kumajiro. Carved by Nisei Horiei.